Pixar veteran Andrew Gordon reveals the secrets to getting your foot through Pixar's door. For many animators, getting a job at Pixar is the holy grail. The animation giant has gone strength to strength since its inception back in 1986, and the main reason for that is the people who work there. 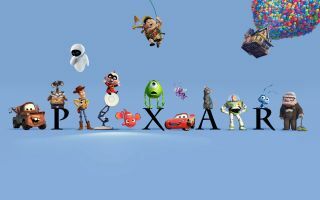 Pixar only employs the best, and it's notoriously difficult to get a foot in the door. It's not all just about talent; understanding how the company works and your best way in is key. And we're here to help. What's the best way into the industry? "Definitely don’t have blinkers on of ‘I just want to work at Pixar’ or ‘I just want to work here’. Basically get as much experience as you can, anywhere you can, and do the best possible job you can. Ultimately you have to do the not-so-great jobs in order to get to the one you want. "Internships are great if you can get them. I literally would say, ‘Look, I'll pack a box or I’ll clean the toilets’ but just let me work on this machine that no one has access to. Back then you could not get access to the software, but since that’s not as much of an issue now, it's more about getting an internship to work with someone in the industry that you respect. So when picking those internships you have to look at people and places and think, well, how can I learn? But also it really is about getting your foot in the door, also having a good attitude and not feeling like everything is too comfy. When picking internships, look at people and places and think, how can I learn? "I led internships at Pixar about three times and some of the danger of the interns coming in is that Pixar is a very cushy job. It's got a nice gym, great education and they make it very comfortable. But sometimes it gets a bit too comfortable for these new guys and I think there’s a danger in that. It’s not that they shouldn’t have fun but at the same time it's like, sink your work into your shot, not playing basketball for two hours. "For the new animators it's just getting experience and if you don’t have access to experience, get yourself goals and assignments to do. Sign up for a class; do something where you are basically doing work, getting feedback on it and so growing and getting better. There’s so many ways to get that now. The internet has basically opened up new worlds. How does Pixar choose who qualifies for internships? "The applications are filtered down, looking for the really good people and then it just goes through a continual review process. Everyone just sits in a room, puts all the reels in a circle and watches them over and over again, until they end up with the final choices. "Sometimes it comes down to a wildcard, you know, 'That person is crazy but we're going to go for it." And then there's the people that are obviously gifted and then the people that have potential. There's not one specific reel that's going to bag you a place. "At the end of the day, it comes down to having good idea. And good sensibilities. It's not about having a perfectly polished walk cycle; it really comes down to the ideas and the acting ideas as well." What three pieces of advice do you have for budding animators? "Firstly, build a really strong foundation of traditional art because even though you don't have to learn it, it helps in the design of poses, in the staging of shots, etc. So I would say learn as much about that stuff as you can before you start on the computer. "Then I'd say, really sink yourself into your work and just be dedicated to it and focus on an aspect of it that you like. If you want to be a lighter, go into lighting. If you like animation, focus on animations and not so much on lighting. Really go deep in your understanding of your profession. "The last thing is to be smart about knowing what you would eventually want to be. Being an animator for 15-20 years, it's definitely rewarding work. But at some point you want to be able to have the chops to do other things, whether it be directing or doing a short. I think that doing films or pieces of work that show storytelling ultimately helps in the very end or during your career because the medium is all about telling stories, it's not just about one or two shots. It's about bringing across a character or a moment and not losing sight of that. "I've been doing this for 15 years and I'm still looking for new experiences. You have to keep learning. Once you get complacent, you sit in your job and just do the same thing over and over – that's the danger. You've got to always be pushing." Does Pixar require a particular education to get hired or is it based on portfolio? "I think any art-based job is more about your portfolio and less about credentials. Because at the end of the day employers want to know that you can do the job. You could have a master’s degree or a Dr in animation if it was possible to get one, it doesn’t matter. "At the end of the day, we're looking for people that have a quality or a sensibility of either animation or design. Whether it be designing characters, a storyboard or being an animator, there really is something that that department is looking for. "With my department (animation) we’re looking for people who are great actors or that show tremendous potential. If they have some serious acting skills, we will take a chance. That’s half the battle you know, really finding those types of people. "You get a lot of reels that are the same type of reel all featuring the same exercises. But the ones that are rare are where the applicant has done something different in their approach. "We will always look at reels from all creative fields, including motion designers, but we always have to think about where we are going to put that person. A lot of motion designers, if we're talking about After Effects type of things, are the people that might do the credits or animate the storyboards."